People love this signed, numbered limited edition of Neil Gaiman's Stardust so much, they want it to buy more goats. For the last few years fantasy author Patrick Rothfuss, he of Kingkiller Chronicle fame, has been organizing a Worldbuilders charity auction to benefit Heifer International, a nonprofit that sends goats and other animals to communities that need them. 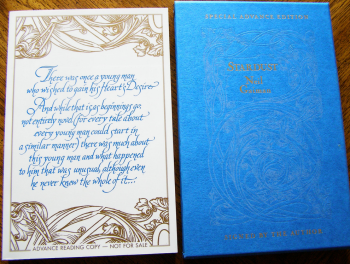 One of the items Rothfuss has been able to put up in the raffle each year is a rare, limited edition of Neil Gaiman's Stardust, and he's been able to do that each year since 2009, because nobody who wins wants to keep it. It's now back in the charity lottery, for the fifth time running. The first time it came up, in 2009, the winner decided to give it back to Worldbuilders, so it could raise more cash. In 2010 it sold on eBay for $2,500, and when Rothfuss contacted the buyer to arrange shipping, the auction winner said Stardust should go back into the mix again, to raise even more money. Then 2011 rolled around, and winner Maayan, conscious that this was becoming a thing, said sure, put Stardust back. It's meant to raise more cash for goats. Then Maayan won a second time, in 2012. "When Pat called me this year to say that I had won again, I'm pretty sure my first words were, 'No, I did not!'" said the incredibly lucky winner. "Surprised doesn't begin to describe it." This time she took possession just long enough to touch it, before sending it back to Rothfuss for yet another go at raising cash for heifers. So now it's up for the Worldbuilders lottery yet again, and if you want to take a shot at the legend - or just donate some cash - head over here and put some money on the line. It'll run until February 1st. Remember, it's a numbered, limited edition of Stardust in its own slipcase, signed by Neil Gaiman himself. It could be yours, at least for a few moments before conscience gets the better of you, and you hand it back. After all, goats don't buy themselves.